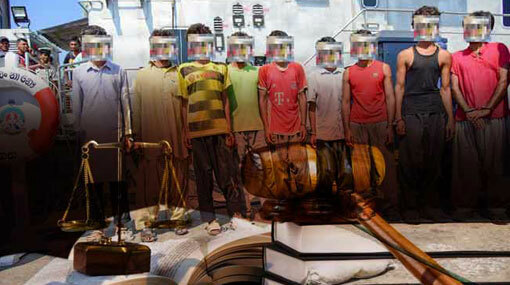 The Colombo Magistrate’s Court has permitted the Police Narcotics Bureau (PNB) to detain and interrogate the nine Iranians, who were arrested on March 24th with over 100kg of heroin. The suspects were produced before the Colombo Chief Magistrate Lanka Jayaratne today (25). As these suspects are not able to communicate in English, the police said the assistance of the Embassy of Iran in Sri Lanka will be acquired to record statements from them. Accordingly, the Chief Magistrate ordered to detain the suspects until March 29th and ordered the PNB to submit a report on the progress of the investigations on that day. On March 24th, in a joint operation conducted by the Police Narcotics Bureau, the Special Task Force (STF) and Sri Lanka Navy on the Southern Sea, an Iranian ship carrying nine suspects was held along with over 100kg of heroin. The seized heroin haul was estimated to be worth nearly Rs 1 billion. The STF suspected that another 500 kg of heroin to have been dumped into the sea by the suspects, prior to the arrest.